Microflex® XCEED™ gloves utilize a breakthrough polymer technology and state of the art manufacturing process to throw the traditional weight=strength relationship out the door. Engineered to give you the fit and feel of latex, this nitrile is up to 60% stronger than leading nitrile brands. This glove changes everything! Microflex's Xceed gloves offer a unique combination of benefits for any disposable examination glove user (nitrile or latex) looking to increase glove quality and durability at an affordable price. The gloves mimic the soft fit, feel and tactile sensitivity of disposable natural rubber latex gloves, while delivering up to 90% greater tensile strength. 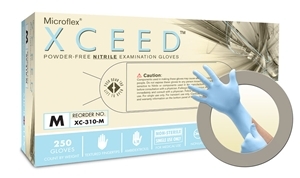 Microflex said the Xceed nitrile disposable examination gloves will be available in a 250-count box (2,500 gloves per case). We are confident you’ll agree, this is the best glove you’ve ever worn! Recommended for use in the following industries: Dental, Healthcare, Laboratory, Tattoo, Industrial Safety and Manufacturing. Comfort... XCEEDTM gloves are soft and provide improved tactile sensitivity which helps reduce hand fatigue. Strength... New formulation raises the bar in strength and durability in disposable examination gloves. Value Packed... Each box contains 250 gloves which is 2.5 times more gloves than the average 100 count box. Value packing saves you money and time. In addition, value packing is better for the environment.